Delphi XE2 is the major breakthrough in the line of all Delphi versions of this product. It allows deploying your applications both on Windows and Mac OS platforms. Additionally, it is now possible to create 64-bit Windows applications to fully benefit from the power of new hardware. Moreover, you can create visually spectacular applications with the help of the FireMonkey GPU application platform. VCL styles for Windows applications. For more information about Delphi XE2, please refer to Delphi XE2 Overview article on Embarcadero website. 64-bit platform support implies several important changes that each developer must keep in mind prior to the development of a new application or the modernization of an old one. 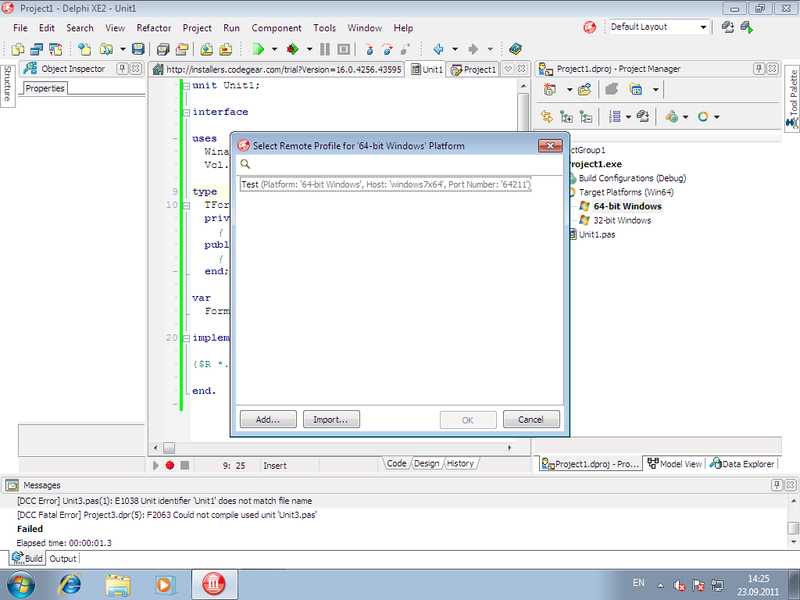 Delphi XE2 IDE is a 32-bit application. It means that it cannot load 64-bit packages at design-time. So, all design-time packages in Delphi XE2 IDE are 32-bit. Therefore, if you develop your own components, you should remember that for the purpose of developing components with the 64-bit platform support, you have to compile run-time packages both for the 32- and 64-bit platforms, while design-time packages need to be compiled only for the 32-bit platform. This might be a source of difficulties if your package is both a run-time and a design-time package, as it is more than likely that this package won’t be compiled for the 64-bit platform. In this case, you will have to separate your package into two packages, one of which will be used as run-time only, and the other as design-time only. For the same reason, if your design-time packages require that certain DLLs be loaded, you should remember that design-time packages can be only 32-bit and that is why they can load only 32-bit versions of these DLLs, while at run-time 64-bit versions of the DLLs will be loaded. Correspondingly, if there are only 64-bit versions of the DLL on your computer, you won’t be able to use all functions at design-time and, vice versa, if you have only 32-bit versions of the DLLs, your applications that are compiled for the 64-bit platform won’t be able to work at run-time. Extended80 – whose size in 32-bit application is 10 bytes; however, this type provides the same precision as its 8-byte equivalent in 64-bit applications. Extended80Rec – can be used to perform low-level operations on an extended precision floating-point value. For example, the sign, the exponent, and the mantissa can be changed separately. It enables you to perform memory-related operations with 10-bit floating-point variables, but not extended-precision arithmetic operations. The major difference between 32- and 64-bit platforms is the volume of the used memory and, correspondingly, the size of the pointer that is used to address large memory volumes. Some WinAPI functions have OUT parameters of the SIZE_T type, which is equivalent to NativeInt in Delphi XE2. The problem is that if you are developing only a 32-bit application, you won’t be able to pass Integer to OUT, while in a 64-bit application, you will not be able to pass Int64; in both cases you have to pass NativeInt. MyProc(Value2); // will not be compiled !!! If you pass pointers to SendMessage/PostMessage/TControl.Perform, the wParam and lParam parameters should be type-casted to the WPARAM/LPARAM type and not to Integer/Longint. Replace SetWindowLong/GetWindowLog with SetWindowLongPtr/GetWindowLongPtr for GWLP_HINSTANCE, GWLP_ID, GWLP_USERDATA, GWLP_HWNDPARENT and GWLP_WNDPROC as they return pointers and handles. Pointers that are passed to SetWindowLongPtr should be type-casted to LONG_PTR and not to Integer/Longint. 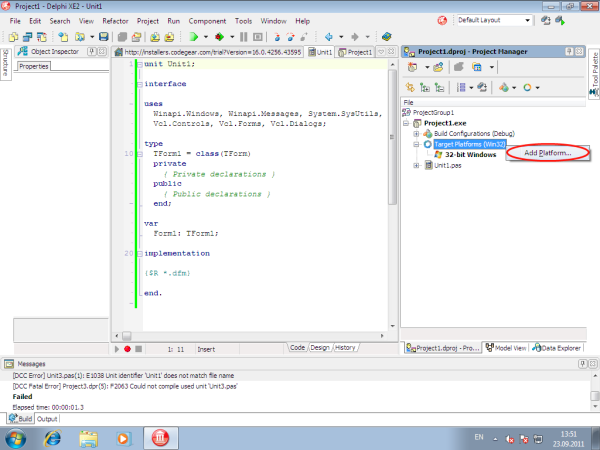 Pointers that are assigned to the TMessage.Result field should use a type-cast to LRESULT instead of Integer/Longint. rewrite assembly code that doesn’t consider architecture and processor specifics. You can use conditional defines to make your application work with different architectures. You can learn more about Assembly code here. You can also look at the following article that will help you to make your application support the 64-bit platform. The biggest difference in exception handling between Delphi 32 and 64-bit is that in Delphi XE2 64-bit you will gain more performance because of different internal exception mechanism. For 32-bit applications, the Delphi compiler (dcc32.exe) generates additional code that is executed any way and that causes performance loss. The 64-bit compiler (dcc64.exe) doesn’t generate such code, it generates metadata and stores it in the PDATA section of an executable file instead. But in Delphi XE2 64-bit it’s impossible to have more than 16 levels of nested exceptions. Having more than 16 levels of nested exceptions will cause a Run Time error. 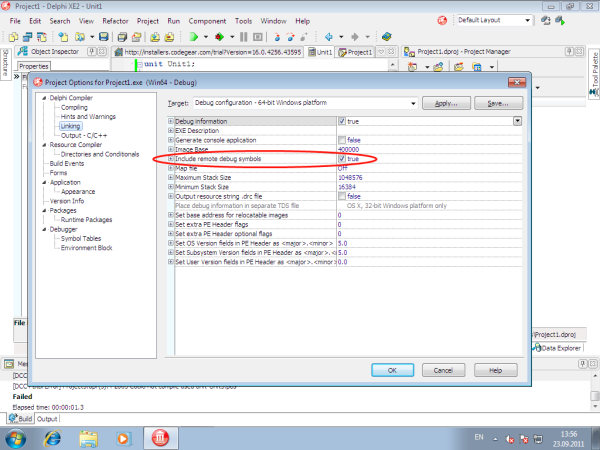 Debugging of 64-bit applications in Delphi XE2 is remote. It is caused by the same reason: Delphi XE2 IDE is a 32 application, but your application is 64-bit. If you are trying to debug your application and you cannot do it, you should check that the Include remote debug symbols project option is enabled. Open Project Options (in the main menu Project->Options). In the Target combobox, select Debug configuration – 64-bit Windows platform. 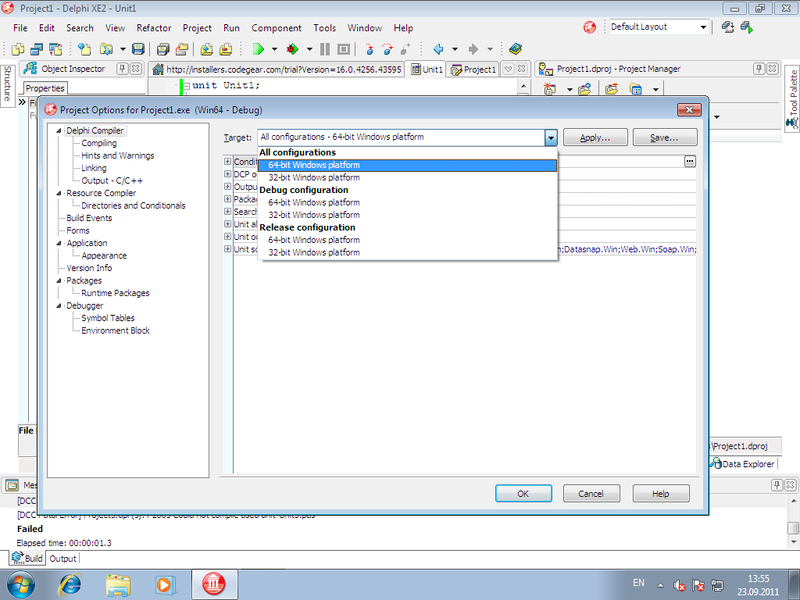 If there is no such option in the combobox, right-click Target Platforms in Project Manager and select Add platform. After adding the 64-bit Windows platform, the Debug configuration – 64-bit Windows platform option will be available in the Target combobox. Select Linking in the left part of the Project Options form. 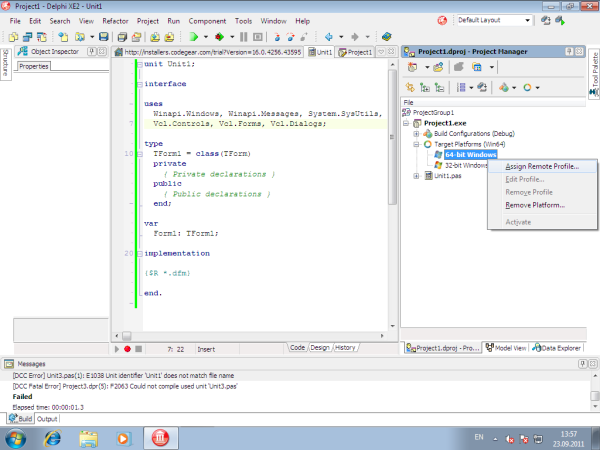 Enable the Include remote debug symbols option. After that, you can run and debug your 64-bit application. file is an istallation file for MacOS. Run the PAServer.exe file on a remote computer and set the password that will be used to connect to this computer. 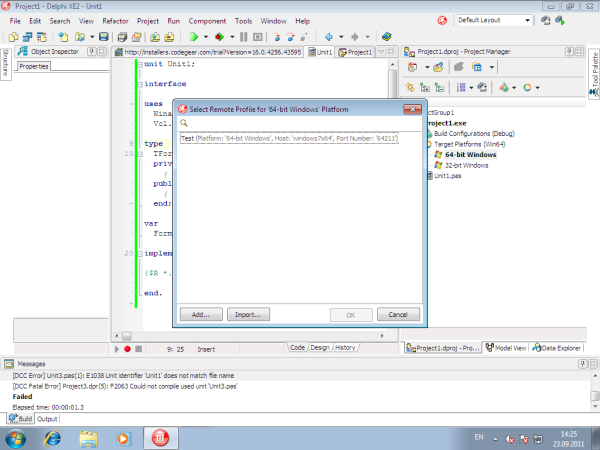 On a local computer with Delphi XE2 installed, right-click the target platform that you want to debug in Project Manager and select Assign Remote Profile. Click the Add button in the displayed window and input your profile name. 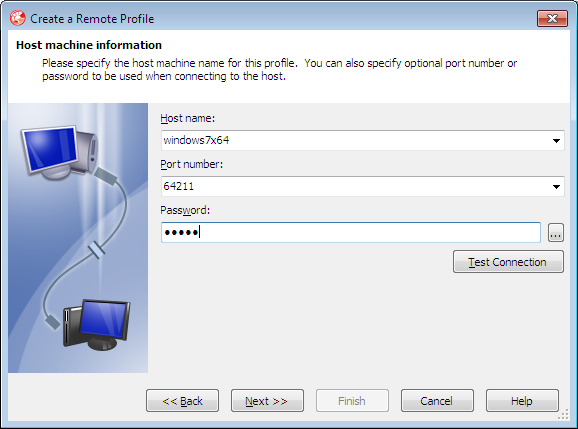 Click the Next button, input the name of a remote computer and the password to it (that you assigned when you started PAServer on a remote computer). After that, you can test the connection by clicking the Test Connection button. If your connection failed, check that your firewalls on both remote and local computers do not block your connection, and try to establish a connection once more. If your connection succeeded, click the Next button and then the Finish button. 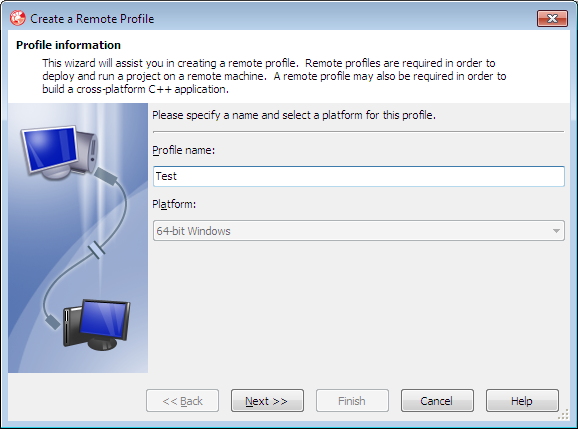 Select your newly created profile and click OK.
After performing these steps you will be able to debug your application on a remote computer. 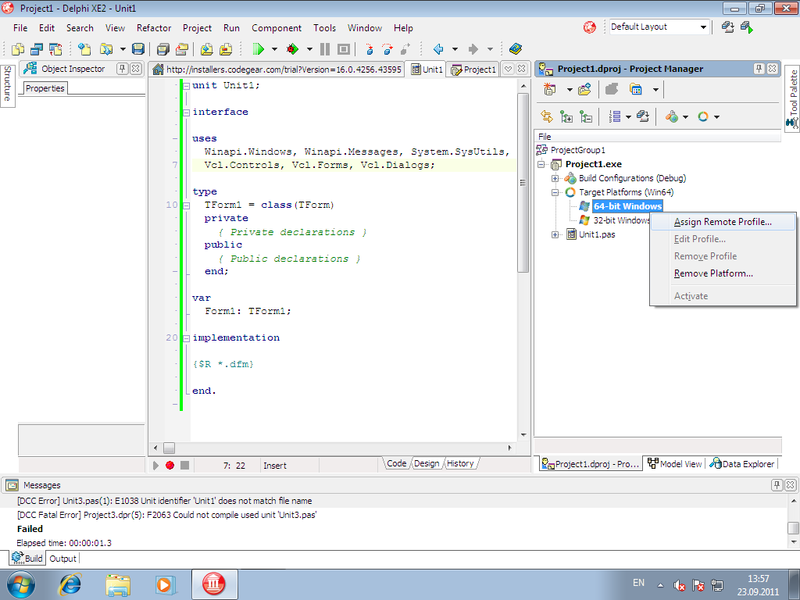 You application will be executed on a remote computer, but you will be able to debug it on your local computer with Delphi XE2. For more information about working with Platform Assistant Server, please refer to this article. For each database, the specifics of the 64-bit development is mainly conditioned by the use of particular database client libraries. When our connectivity solutions are used in Direct mode (without involving database client software), the specifics of developing applications depends exclusively on peculiarities of 64-bit platform regardless of the used database. For example, our PostgreSQL connectivity solutions (PgDAC, UniDAC and dbExpress Driver for PostgreSQL) work with the PostgreSQL database directly. Our connectivity solutions for Oracle and MySQL can be used in Direct mode as well as with the corresponding database client. For our connectivity solutions, using DBMS client libraries, the following requiements should be met. 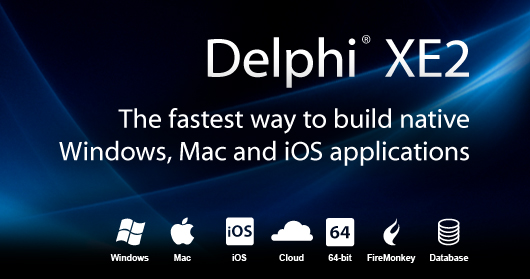 As Delphi XE2 is a 32-bit application, it can load only 32-bit libraries. So, to connect to the database at design-time, you need to use 32-bit client library, while at run-time you will need the 64-bit client library. For SQL Server, InterBase and Firebird, MySQL (in client mode), and SQLite you need to place the 32-bit client library to the C:WindowsSysWOW64 directory (if you need to connect to the database at design-time), and the 64-bit client library, used for connecting to the database at run-time, to the C:WindowsSystem32 directory. Note that developers of SQLite do not provide a ready driver for x64 platforms, and for x64 applications you need to manually compile the sqlite library (for example, in MS VisualStudio). Our connectivity solutions for Oracle (ODAC, UniDAC, dbExpress driver for Oracle) use the DEFAULT Oracle Client as standard, so depending on the capacity of the DEFAULT Oracle Client you need to explicitly specify either the 64-bit client for run-time (if the DEFAULT Oracle Client is 32-bit), or the 32-bit client for design-time (if the DEFAULT Oracle Client is 64-bit), or you may explicitly specify both clients – for run-time and for design-time. When developing cross-platform application using UniDAC to work with the MS Access database, you should remember that it is impossible to install two (32- and 64-bit) drivers on the same system (Microsoft limitation). 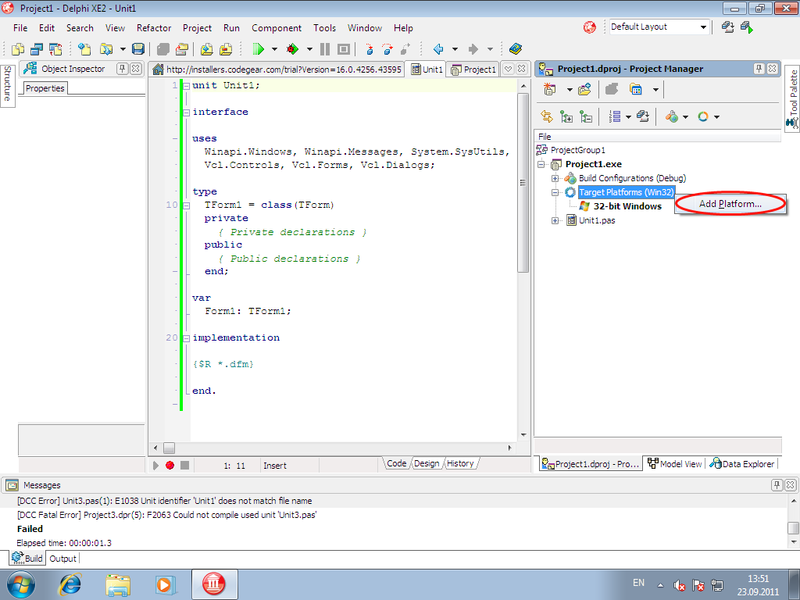 That is why, if you need to connect to the database at design-time, the 32-bit driver must be installed on the development computer, since Delphi XE2 uses x32 libraries at design-time. If no such connection is needed, you can install the x64 MS Access driver. All the other aspects of x64 and x32 development are identical. As regards using UniDAC for connecting to other database servers through ODBC, for information on drivers for different platforms and specifics contact their developers. This article is very good and usefull,thank you! theme/design), I don’t have time to look over it all at the minute but I have bookmarked it and also added your RSS feeds, so when I have time I will be back to read more, Please do keep up the excellent job. Thank you for your kind words, Alfredo. We highly appreciate your interest.